With more than 13,000,000 accounts and 1,500,000 deals every day, IQ Option boasts of a robust presence in the binary options trading industry. To get an answer to this question, we decided to do a background check on IQ Option and reviewed its key features, as described below. IQ Option introduced its website in 2013. We noticed that the site is elegantly designed with everything on its rightful place. Notably, the account opening process on the site is quick and straightforward. Perhaps, the simplicity of the site, along with the broker’s commitment to offer unmatched conditions to traders, could be the main reason propelling its rapid growth in the industry. 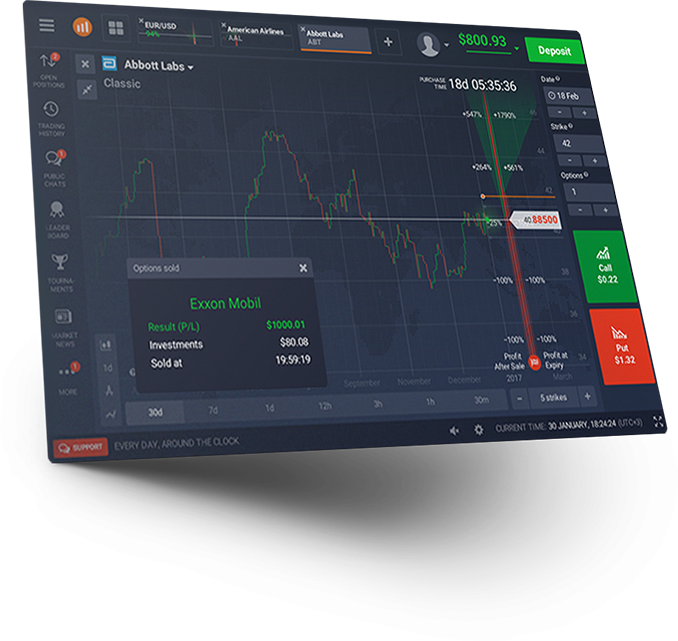 IQ Option’s state-of-the-art trading platform provides traders with the fastest trading conditions for making the most out of their binary options trading experience. The platform can be used without downloading in a browser, downloaded on a Windows computer, or downloaded as a mobile application on any iOS or Windows device. This way, traders have a variety of ways for accessing the market without any limitations. IQ Option provides a demo account of $1,000 to enable traders perfect their skills and become successful in their careers. You’ll need to deposit a minimum amount of $10 before you can start trading on the broker’s live account. Importantly, IQ Option offers a variety of comfortable and secure payment methods to ensure clients’ have a peace of mind with their transactions. If you are based in the U.S., you’ll not be able to use IQ Option’s brokerage services. Nevertheless, the broker allows traders from other 178 countries around the world. With IQ Option, you can earn up to 92% profits for every successful trade. This is among the highest payouts in the binary options trading industry. In 2016, IQ Option improved its infrastructure to allow for instant withdrawals. Previously, it took up to four working days to process withdrawals. However, currently, 72% of withdrawal requests are processed immediately. IQ Option offers a bonus amount of up to 50% for new deposits. With the bonus, you can increase your capital outlay and appropriately manage your risks while trading. The broker is committed to addressing the needs of customers so that they enjoy a rewarding trading experience. As such, its customer service department has more than 50 specialists who provide support 24/7 via phone, email, live chat, or ticketing system. Notably, it takes an average of just 46 seconds to get an answer via live chat and 24 minutes to process a support ticket. IQ Option operates under regulatory conditions, and is not a scam broker. IQ Option is the trading name of a company called Iqoption limited, which is registered in Seychelles under license number 094224 to offer services in binary options trading. Therefore, you can always be sure of dealing with a highly credible broker. If not, why would more than 13 million traders trust it with their accounts? To cater for the diverse needs and trading styles of traders, IQ Option offers a varied range of financial instruments for trading, including commodities, stocks, indices, and currency pairs. The broker also offers a range of trading methods, such as high/low and 60-second options, with flexible expiry times ranging from 60 seconds to more than 24 hours. IQ Option recognizes that it serves millions of traders coming from different backgrounds. Therefore, it offers support to a wide range of languages, including English, Spanish, Indonesia, Dutch, French, Portuguese, Italian, Russian, Turkish, Swedish, Korean, and Chinese. As illustrated by the above key features of IQ Option, we can confidently affirm it deserves the leading position in the binary options industry. Do you want to experience the ultimate trading experience? Then, open an account with IQ Option today!